Just when you thought that laziness came in the form of ready-made, uncrusted PB&J sandwiches, New England Bites has taken it up a notch - bagels with the cream cheese already on it! 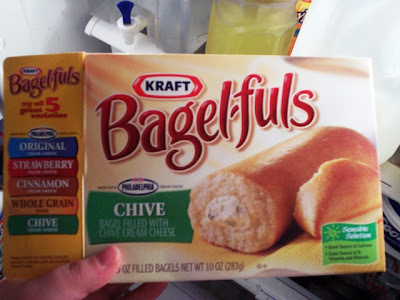 When we first saw Kraft Bagel-fuls, which come in a variety of flavors, I honestly thought they were going fall flat. However, when Mom decided to buy them (a.k.a., she had a coupon), I oohed and ahhed over the ease at the actual cooking process. Even I could do this! THE VERDICT: Great taste with no effort = fantastic! After taking the log-shaped Bagel-ful out of its little plastic wrap, place it in the microwave for 10 seconds and you're done! It tastes like an untoasted bagel with cream cheese - which is exactly what it is. However, I do have a word of advice for other lazies like myself: WAIT UNTIL IT COOLS BEFORE EATING! Do you know how HOT the cream cheese will get if you dig in right away? Or maybe you've left it in for more than 10 seconds (oops) and couldn't wait to take a bite. Please do not do this, but definitely try Kraft Bagel-fuls. It's like making breakfast without actually making it. Enjoy!